Why have radio and television never been granted the same First Amendment freedoms that we have always accorded the printed word? 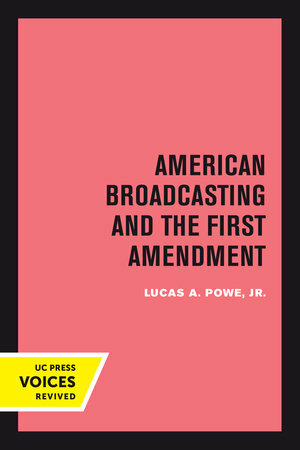 In this fascinating work, Lucas A. Powe, Jr., examines the strange paradox governing our treatment of the two types of media. This title is part of UC Press's Voices Revived program, which commemorates University of California Press’s mission to seek out and cultivate the brightest minds and give them voice, reach, and impact. Drawing on a backlist dating to 1893, Voices Revived makes high-quality, peer-reviewed scholarship accessible once again using print-on-demand technology. This title was originally published in 1987. Lucas A. Powe, Jr. is the Anne Green Regents Chair in Law and Professor of Government at the University of Texas at Austin.